To leave a lasting legacy. Nurturing soft washing businesses and fostering opportunities in faith, family, hope and community. SoftWash Systems vision is to see 1,000 softwashing businesses worldwide, thriving under our business model by the year 2040. In 1992, AC Lockyer used his background in horticulture to look at the problem of algae streaking in a different way. Instead of utilizing traditional pressure washing equipment commonly used in the exterior cleaning industry, he went with a totally chemical approach. This “completely chemical” cleaning system was developed in 1992 and called the Mallard System. Green Wash was tested in a major shingle manufacturer’s laboratory and judged safe for use on shingle roofs. In the testing process two shingles were taken directly from the manufacturing line for testing purposes. One was coated in a bleach and water solution that also contained Green Wash. The other was not treated at all. Both shingles were then placed in testing ovens at 300 degrees and 100% humidity for thirty days (this test simulates 30 years of shingle aging). The results showed that the shingle treated with our soft washing solution had less apparent aging than the one that was not treated at all. Based upon that test AC’s company was chosen to perform cleanings on that manufacturer’s shingle roofing products. Why Choose a SoftWash Systems In-Network Roof Cleaning & Exterior Soft Washing Professional? It is because of our strengths! 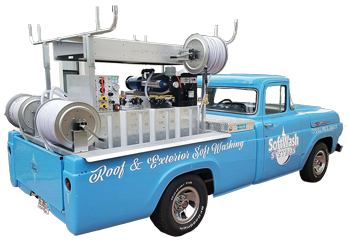 SoftWash Systems through their equipment, chemicals, education and support have been able to assemble a International Network of exterior cleaning companies that are similarly prepared to serve you. All of this with our training and events throughout the US for our in-network soft washing professionals. SoftWash Systems isn’t a new “GREEN” company. We have always had a strong commitment to being more than green. Our company has core values that places stewardship and service above profits. We believe that profits will come as we focus on doing business in a way that honors our values. This is our “world is round” mindset and “what we reap we sew” is in our moral fiber. Our pledge to passing on a clean, healthy environment is what we have deemed as our Good Stewards program. As Good Stewards, the in-network companies of SoftWash Systems believe and practice, protocols and standards, that are for more than just compliance. They are because we wholeheartedly understand we are stewards of the resources we have been entrusted with. You as a customer of the in-network companies of SoftWash Systems entrust us with your property and we respect that. That respect also transfers to the land, water and air surrounding your property as well. SoftWash Systems has developed technology around this Good Stewards pledge. Here are a few of the technology advancements that make SoftWash Systems unique in the cleaning industry. Pressure/power washers use from 3 to 8 gallons of water per minute (gpm). In one hour of cleaning a pressure / power washer can use from 180 gallons upwards to 480 gallons of water. Conversely soft washing will be only applying up to 60 gallons of cleaning solution, that is comprised of about 40 gallons of water, in that same hour. Then that soft washing solution loosens and dissolves mildew, bacteria, dirt and grime so it can be easily rinsed away with a garden hose. In fact many soft washed surfaces do not need rinsed after cleaning even further reducing the need for water during the cleaning. Good Stewards means SoftWash Systems uses 1/3 the water of pressure / power washing. The in-network companies of SoftWash Systems exclusively use SoftWash Systems chemicals for soft washing your property. These chemicals have been completely biodegradable since 1998, long before “green” was in fashion. Biodegradable means that our chemicals break down into carbon and water within twenty (20) days of their introduction into the environment. Our chemicals are water based and ship non-hazardous. Good Stewards means SoftWash Systems leaves no contaminants behind. Volatile Organic Compounds better known as VOC’s are basically vapors in the air that are either pollutants, toxins or irritants. Though some of our solutions have scents added or might omit fumes while cleaning these compounds are measured less than one part per million (-1/1,000,000) within 50 feet of any surface we are cleaning. Because one of our core values is service we are sensitive to people with special needs within or close to our work sites. With appropriate notice, any SoftWash Systems in-network company is pleased to adjust work schedules or change solution formulations to accommodate the special needs of those who have chemical intolerances. 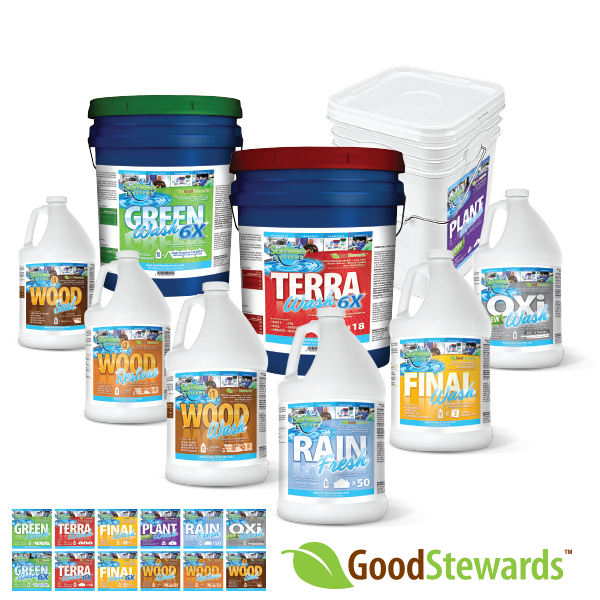 Good Stewards means SoftWash Systems believes clean air is as important as a clean home. Fossil fuels are certainly not evil, however we at SoftWash Systems as well as our in-network companies have a desire to limit the consumption of fossil fuels for three basic reasons. Good Stewards means SoftWash Systems is open to using fuel oil alternatives. SoftWash Systems has made a significant investment in the development of alternative sources for powering our cleaning equipment. All of our soft washing cleaning equipment is powered by a bank of 12 volt DC batteries. In-network companies can choose to equip their systems with special DC charging systems that harness the power their trucks create driving from job site to job site. Then this DC power is collected and stored in the systems 12 volt battery bank. With the addition of an DC to AC power inverter we are able to power rinse pumps and leaf blowers without fossil fuels. Good Stewards means SoftWash Systems will lead the way in development of AC and DC electrical equipment. Pressure/power washing merely gives mildew and bacteria a hair cut. Because pressure / power washing only blasts away at the surface algae, fungus, mold, bacteria and viruses can reemerge from deeper in the crevices of the surface. You may have noticed than when you use pressure / power washing equipment that each time you clean the following cleanings are needed sooner and sooner. SoftWash Systems equipment and chemicals treat mildew, bacteria and viruses like a pest not a stain, with a clean that lasts four to six times longer than pressure / power washing. Good Stewards means SoftWash Systems innovations bring longer lasting results with fewer cleanings. Soft washing was developed by AC Lockyer with his knowledge and experience in plant sciences and horticulture. AC knew that the bacteria, molds, fungi, and algae growing on the exterior of buildings were more closely associated with an infection than a stain. Knowing this AC drew from his experiences and combined the technology of treating pests and fungus on plants with compatible cleaning chemicals, thereby inventing a method of soft washing. Now instead of the blowing and blasting of pressure washing, property owners could have cleanings done without the damages normally associated with pressure washing. Soft washing then developed ways to clean other surfaces in differing regions of the country. Once just used to eradicate mold and mildew, SoftWash Systems developed new chemicals and techniques to take this advanced cleaning into dry, arid climates as well. SoftWash Systems through our equipment, chemicals, education, and support have been able to assemble a National Network of exterior cleaning companies that are similarly prepared to serve you. Our training and events throughout the US for our in-network soft washing professionals’ ensure they are prepared in the industry. 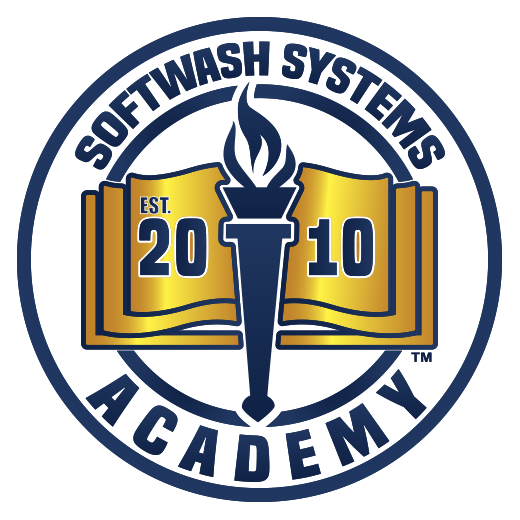 Each SoftWash Systems In-Network Company has to undergo hours of training in classroom, online and at our hands-on training events. Every employee of those companies has been tested and certified for their individual job description, through our training programs. There is no other national cleaning company that has as robust of a training system as SoftWash Systems and our in-network companies imitate that to make their cleaning and soft washing companies the very best in the industry. As property owners that need reliable professional exterior cleaning services you can count on SoftWash Systems to provide proficient, reliable companies you can trust. These exterior soft washing and roof cleaning companies make your job of managing your property a pleasure not a burden, at least when it comes to working with our companies. We strive towards the common goal of you having a clean, attractive property in your portfolio. Whether you have an existing business you wish to add soft washing to; or you are starting new with your first business venture, SoftWash Systems makes starting this journey easy. Ease is one thing, but proven and profitable is another. SoftWash Systems puts the systems in the soft washing business. We endeavor each and every day to create the equipment, chemicals, education and support that are the envy of all others in the soft washing industry. We are here for you, providing you with all the tools you will need for your business to reach the highest possible levels of success. SoftWash Systems also leads several training events throughout the year and attends many annual conventions and industry association trade shows. All events can be found on our calendar under the Academy page on our website. We make ourselves available regionally so you can easily participate in our industry events. Starting down the path to profitability in soft washing only takes one phone call. Please feel free to contact us at our office, 855-763-8669. We would be happy to aid you in directing your attention to several resources we have available to help you make informed decisions about adding soft wash roof and exterior cleaning services to your business. We have thoroughly trained agents that can answer your questions. Remember, at SoftWash Systems we put the systems in the soft washing business.